The Berzerker is built for the confident rider who likes riding the whole mountain and riding it fast. Even though it’s less aggressive than previous incarnations, this is still on the more aggressive side of the spectrum. 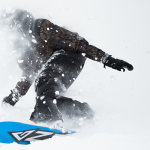 Jake Blauvelt’s pro model, the Berzerker underwent a massive overhaul for 2016. 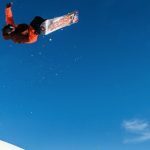 Softer than previous versions, it’s still built for riders who aspire to assault the mountain like Blauvelt—snowboarders who ride with speed and power. The hybrid camber board has plenty of pop and the shovel nose loves plowing through powder and inconsistent snow. The mid-width deck is also available in wide versions for longer lengths. The board handles well thanks to carbon stringers that keep the deck responsive (maybe too responsive for some riders). With traditional camber underfoot, and reverse camber near the nose, it has a modicum of looseness. This board has a reputation of being incredibly stiff. This year’s model is less so: Ride calls it a five on their scale of 1 to 10. With sufficient pop thanks to some stiffness left in the tail, the Berzerker transfers plenty of energy to your turns, the faster the better. The blunt nose and reverse camber up top is great for pow or to plow through chunky snow. Comfortable anywhere on the mountain, this deck is best at speed on corduroy or in the sidecountry/backcountry. No slouch when the slopes turns icy, the edge hold is above average. Built overseas, the Berzerker is pretty bombproof. But, it’s far from being a “green” deck.